A couple weeks ago, i sensed something wrong with my motorcycle. It feel unstable when turning, and there is noise from the rear side. 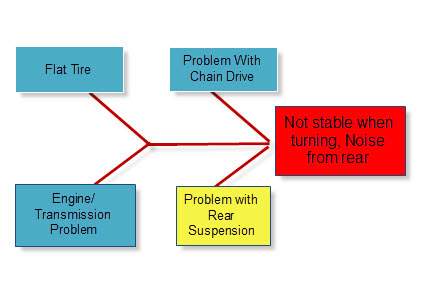 After conduct root cause analysis, and examine my motorcycle, i found the problem causes. It comes from the rear suspension. Then I bought it to the service point to repair the suspension. The mechanic said to me that the suspension need to be replaced, then he explained two alternatives of suspension replacement. A new manufacturing original one, and a cheaper one (not manufacturing original). I have chosen the original one, with a little regret because it emptied my wallet. I need to know if my decision is right or wrong. So I perform an engineering economic based analysis as follow. Alternative A : Buy an original rear suspension cost Rp 500,000, lifetime 5 years. Alternative B: Buy cheaper Product of rear suspension cost Rp 200,000 ,Lifetime 2 years. 2. Quantify Time spend for Maintenance. i. the time for repairement is 1 hour. ii. Service point is open on weekdays only, need to request permission on workhour. Alternative A makes me grab Rp 500,000 from my wallet at 1st repairment, while Alternative B only took Rp 200,000. Based on Multi atributes decision making , Alternative A (will be the preferred Alternative. Go to high quality service point to, prevent unnecessary failure after the repairment. Do on time-check up at the service point, right after the end of its lifetime . Sullivan, William G., Wicks, Elin M. & Koelling, C. Patrick (1942), Engineering Economy15th Edition, Singapore: Prentice Hall, Inc. This entry was posted in Adi Nugroho, Week #4, Weekly Submission. Bookmark the permalink. Excellent, Adi!!! Very real problem, and you set it up for solving following the Step by Step process. I especially liked the root cause analysis. Very nicely done!! Keep up the good work and for next week, I would love to see you challenge yourself by using Purchasing Power Parity (Chapter 8) and/or Chapter 12, Risk Analysis tools to solve a real problem, either from your working environment or your personal environment.